Dixon Steele: Anything you want to make you happy? Laurel Gray: [whispers into his ear] I wouldn't want anyone but you. 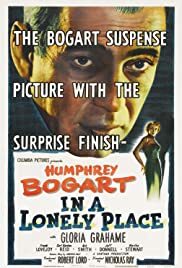 Bogart is at his uncompromisingly dark best as the Hollywood writer whose temper leads to accusations of murder and conflicted relationships. By turns charming, cold, romantic and remorseful, Dix Steele is as unpredictable a character as Bogie has ever played. He shows no emotion on learning that Mildred - the innocent he has just met - has been killed, and those who know him accept his violent nature as simply part of the Steele package. But thanks to the skill of Bogie and director Ray, the audience never entirely loses sympathy for him. The moments of tenderness he shows to his alibi-turned-lover Laurel (an ethereal Gloria Grahame; imagine Hope Davis glammed-up for the 50s) alternate with fits of anger to turn their relationship into that of a tragic poem. 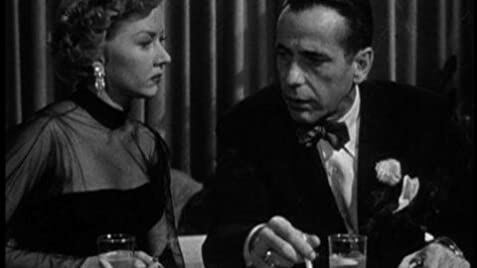 In A Lonely Place is film noir that focuses on romance rather than crime. The reasons for Mildred's murder are never satisfactorily made clear, but it doesn't really matter. 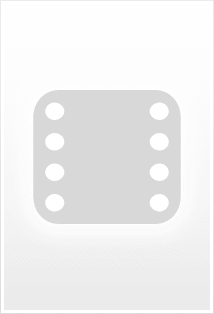 The movie asks whether love and trust are earned by what a person says or what they do. And in the end, actions speak louder than words.